The MP high court on Friday served a notice to the additional chief secretary of the state forest department on a PIL demanding action against errant forest officers for not seeking mandated permission before constructing iron fences for the tiger safari in the buffer zones of Pench Tiger Reserve and Bandhavgarh Tiger Reserve. The iron chain link fencing on the periphery of the tiger safari recently led to the death of eight tigers in Pench and two tigers in Bandhavgarh. “The tigers and other wild animals get trapped in the iron chain link fencing which leads to their deaths,” the petitioner Ajay Dubey a wildlife activist from Bhopal, said. “One of the major recommendations in the NTCA reports is to dismantle the iron chain link fencing of the tiger safari in both the tiger reserves for safe movement of wild animals,” the petitioner’s counsel Varun Tankha and Shivendra Pandey said. The NTCA committee found there was blatant violation of provisions of the Wildlife (Protection) Act and Forest (Conservation) Act, therefore the structures should be dismantled. However, no action had been taken by the state government, the counsel said. 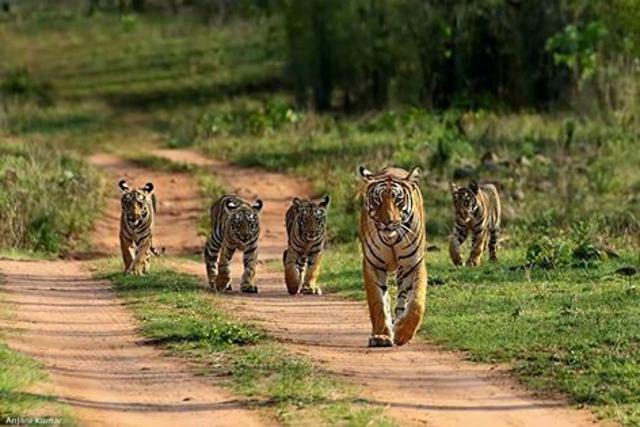 The inspector general of forest (NTCA) Nagpur raised similar concerns in a meeting of the NTCA technical committee in April saying that the construction-related activities had forced the tigers to move into human dominated landscapes, the petitioner said. The state government, in violation of provisions of section 38 of Wildlife (Protection) Act, however, continued with the work even though there was no approval from the committee. The petitioner had secured the copies of the NTCA reports under the right to information act. The court also served notices on the Union government, the secretary of central zoo authority, principal chief conservator of forest (wildlife) and chief wildlife warden of the state forest department Vinay Burman, ex-chief executive officer MP eco tourism board, additional principal chief conservator of forest and ex-principal secretary of the forest department AP Shrivastava.